The State of Knowledge Series presents easy-to-read and comprehensive papers about subjects relevant to Mekong hydropower development. They are meant to be an unbiased appraisal of what we know (and don’t know) about a subject. There are five papers in the series, which draw on both regional and international expertise and experience. 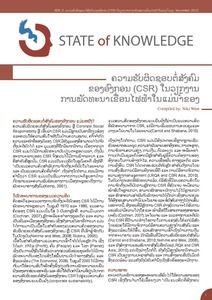 The opinions expressed in the SOK series are those of the authors alone, and are not representative of the opinions of the CGIAR, WLE, the CPWF, or any associated partners. Citation: Dickens, Chris; Cox, Amy; Johnston, Robyn; Davison, Supatra; Henderson, Derin; Meynell, PJ;Shinde, Victor. 2018. 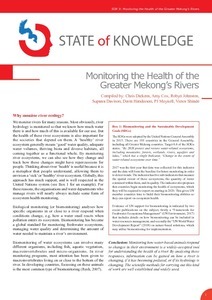 Monitoring the health of the greater Mekong’s rivers. Vientiane, Lao: CGIAR Research Program on Water, Land and Ecosystems (WLE). 12p. Citation: Johnston, R.; McCartney, M.; Liu, S.; Ketelsen, T.; Taylker, L.; Vinh, M.K. ; Ko Ko Gyi, M.; Aung Khin, T.; Ma Ma Gyi, Khin. 2017. State of knowledge: River health in the Salween. Vientiane, Lao PDR: CGIAR Research Program on Water, Land and Ecosystems. 12p. State of Knowledge Series 6. Citation: Johnston, Robyn; McCartney, Matthew; Liu, Shaoyu; Ketelsen, Tarek; Taylor, Luke; Vinh, Mai Ky;Mehm, Ko Ko Gyi; Aung, Theiant; Ma Ma Gyi, Khin. 2017. State of knowledge: River health in the Salween. Vientiane, Lao PDR: CGIAR Research Program on Water, Land and Ecosystems. 12p. State of Knowledge Series 6. Citation: Ketelsen, T.; Taylor, L.; Vinh, M.K. ; Hunter, R.; Johnston, R.; Liu, S.; Kyaw, T.; Ma Ma Gyi, K.; Charles, M. 2017. State of knowledge: River health in the Ayeyarwady. Vientiane, Lao PDR: CGIAR Research Program on Water, Land and Ecosystems (WLE). 15p. State of Knowledge Series 7. Citation: Geheb, Kim; Yu, Xuezhong. 2017. State of Knowledge: Hydropower Environmental Mitigation Measures on the Lancang River. Colombo, Sri Lanka: CGIAR Research Program on Water, Land and Ecosystems. 13p. State of Knowledge Series 8. 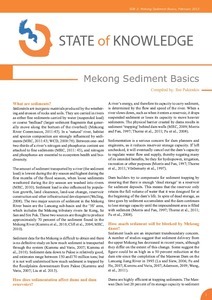 Citation: Pukinskis, I. Mekong Sediment Basics. February, 2013. State of Knowledge Series 2. Vientiane, Lao PDR, Challenge Program on Water and Food. Citation: West, N. 2013. Corporate Social Responsibility in Mekong Hydropower Development. State of Knowledge Series 3. Vientiane, Lao PDR, Challenge Program on Water and Food.